Campaigners are calling on governments attending the latest round of discussions on the implementation of the Arms Trade Treaty (ATT) in Geneva on Monday to set their hypocrisy aside and stop selling billions of dollars worth of deadly weapons to Saudi Arabia being used to attack Yemeni civilians. In a new report released today, the Control Arms Coalition names France, Germany, Italy, Montenegro, the Netherlands, Spain, Sweden, Switzerland, Turkey, the UK, and the U.S. as having reported licenses and sales to Saudi Arabia worth more than $25 billion in 2015 including drones, bombs, torpedoes, rockets and missiles. These are the types of arms currently being used by Saudi Arabia and its allies for gross violations of human rights and possible war crimes during aerial and ground attacks in Yemen. 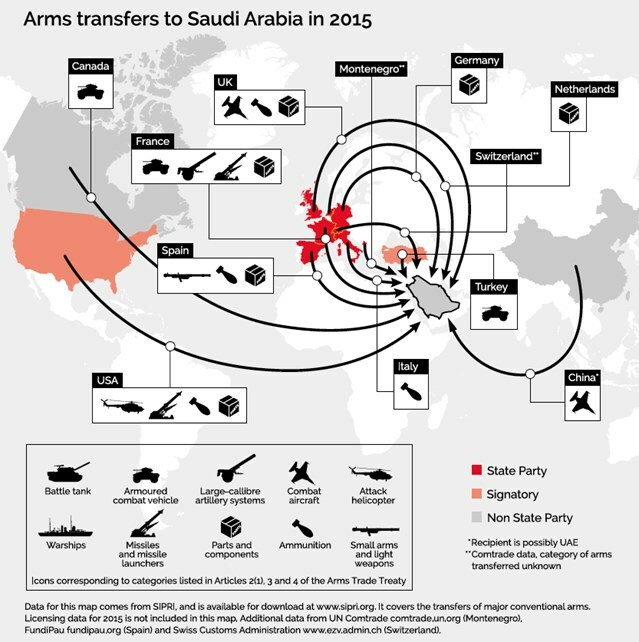 All the arms exporting countries identified in the report are States Parties or signatories to the ATT, which has the aim of “reducing human suffering” through new global rules for the arms trade, which forbid arms transfers that would be used for war crimes or risk being used for serious violations of international law. Governments are attending the Extraordinary Meeting of the Conference of States Parties to the ATT in Geneva on Monday to discuss how implementation of the ATT will be funded and other logistical details regarding the treaty’s official Secretariat. Yemeni researcher Nawal al-Maghafi, who has witnessed the aftermath of recent airstrikes in Yemen and will be attending Monday’s meeting, said: “These countries are arming and aiding a campaign that’s bombing, killing and starving civilians. “I have witnessed the reality Yemenis are having to endure – watching bodies pulled from underneath the rubble in Sana'a or seeing body parts strewn across the site of a water-plant hit by an airstrike in Hajjah or attending a wedding party only to see it turn into a funeral. Control Arms has called on States Parties to include a discussion of the grave situation in Yemen as part of Monday’s meeting, and to commit immediately to halting the transfer of weapons to Saudi Arabia and to its allies where these are at serious risk of being used in Yemen. Anna Macdonald, Director of Control Arms, said: “Governments such as the UK and France were leaders in seeking to secure an ATT – and now they are undermining the commitments they made to reduce human suffering by supplying Saudi Arabia with some of the deadliest weapons in the world. It’s truly sickening. “There is irrefutable evidence showing that these weapons are being used to target residential areas and civilian objects. Around 35,000 people have been killed or injured in less than a year already in this conflict and more than 2.5 million people have lost their homes. Enough is enough. Based on the limited public domain information available, the report estimates the total reported value of arms export licenses and announced sales to Saudi Arabia was more than $25 billion during 2015. Of this, States Parties accounted for over $4.9 billion, though the exact amount is likely to be much higher. From January to November 2015, Italy exported arms, ammunition and spare parts to Saudi Arabia, worth $39.7 million. Under the ATT, all arms deals must be assessed against strict criteria, including the risk of the arms being used for serious human rights violations or war crimes, or of being diverted for terrorist and other criminal acts. The treaty requires that if the transferring state has reasonable knowledge to anticipate that the arms would be used in war crimes, or there is a substantial risk the export will breach any of those criteria, the arms transfer cannot be authorized. Violations are also being committed by Houthi forces, who according to UN experts have captured and acquired arms via diversion, though today’s report does not address this issue due to a lack of reliable data. Amnesty International’s Head of Arms Control and Human Rights Brian Wood said: “Governments approving the export of arms to Saudi Arabia capable of use in Yemen have received many detailed and credible reports from the UN and other reputable bodies over the past months pointing to a pattern of horrific human rights abuses and war crimes committed throughout Yemen by the Kingdom’s forces and allies. “In the face of unbearable suffering of civilians and mounting casualties those governments have failed to enact convincing measures to prevent further violations, conduct independent and impartial investigations or bring the perpetrators to justice, yet, they are carrying on business as usual, and in some cases even escalating arms transfers. This is a clear breach of the golden rules in the Arms Trade Treaty.